Edit, save, and refresh. Revel compiles your code and templates for you, so you don't miss a beat. Code doesn't compile? It gives you a helpful description. Run-time code panic? Revel has you covered. Revel provides routing, parameter parsing, validation, session/flash, templating, caching, job running, a testing framework, and even internationalization. Revel builds on top of the Go HTTP server, which was recently benchmarked to serve three to ten times as many requests as Rails across a variety of loads. 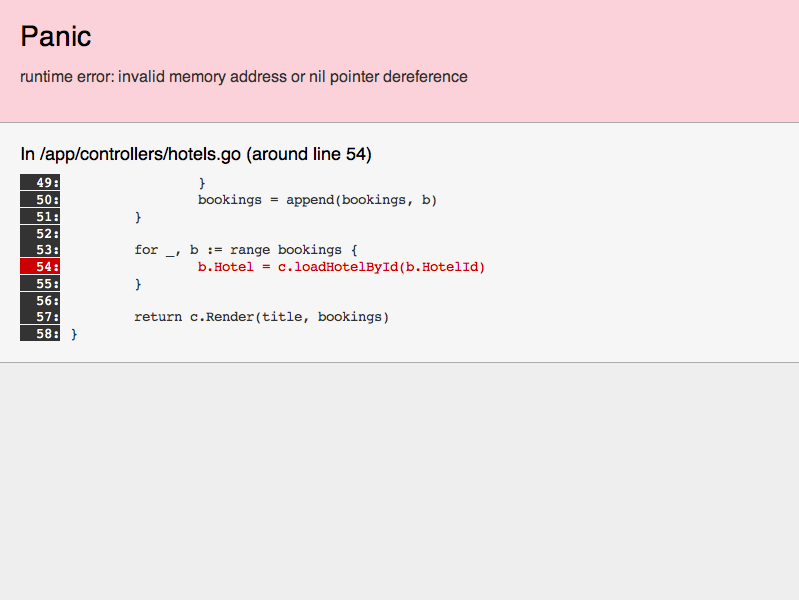 The Go HTTP server runs each request in its own goroutine. Write simple callback-free code without guilt. Revel provides primitives that keep the web tier stateless for predictable scaling. For example, session data is stored in the user cookie, and the cache is backed by a memcached cluster. Revel is built around composable middleware called filters, which implement nearly all request-processing functionality. Developers have the freedom to replace the default filters with custom implementations (e.g. a custom router). Revel ships with sample applications to provide examples of real-world usage. You will need a functioning Go 1.1 installation for this to work. Once it's running, open a browser to http://localhost:9000/, and read how the chat demo is implemented. Development Status Early adopters only. Pull requests welcome. Development is closing in on the "final" 1.0 design, but the rate of change is still high. Expect to get your hands dirty. Join our Google Group to take part in the design and development, or in IRC at Freenode #revel. You may join our announcement list to only be notified for new releases. A simple declarative routing syntax. Type-safe reverse routing. Revel organizes endpoints into Controllers. They provide easy data binding and form validation. Revel makes Go Templates simple to use at scale. Register functionality to be called before or after actions. They can be activated per Controller. More general functionality can be implemented with Filters. WS     /hotels/:id/feed      Hotels.Feed             # WebSockets. POST   /hotels/:id/:action   Hotels. :action          # Automatically route some actions. // Show the hotel information. // Save the updated hotel information and redirect back to Show. Validation. Helpers to manage validation errors. Flash. The flash is a cookie that lives for one request (errors, success messages, etc). Session. The session is a cryptographically signed cookie, exposed as a map[string]string. Results. Redirections take advantage of reverse routing. Template rendering makes your data available using the name of the local variable! By convention, Revel manages to integrate Go Templates easily into the rest of the web app. Here is part of the template rendered in the Register action shown above. Revel found it automatically using the name of the action. field is a simple helper function that returns a map of validation errors and parameter values for the named field. The app may inject any helper funcs that it wants. Interceptors are controller methods that are run before or after requests, or in response to panics. By embedding a controller into another, a developer can share interceptors and fields across many controllers. As an example, the database module may be used to open a connection on initialization, made available through a global handle. Additionally, embedding the db.Transactional type adds a sql.Txn field plus interceptors that begin and commit transactions (or rollback on panic). // Transactional adds transaction management to your controller. Revel provides a default stack of Filters which the developer can override. This makes it easy for the developer to select exactly the parts of the framework that they want to use. // It may be set by the application on initialization. PanicFilter,             // Recover from panics and display an error page instead. FilterConfiguringFilter, // A hook for adding or removing per-Action filters. ParamsFilter,            // Parse parameters into Controller.Params. SessionFilter,           // Restore and write the session cookie. FlashFilter,             // Restore and write the flash cookie. 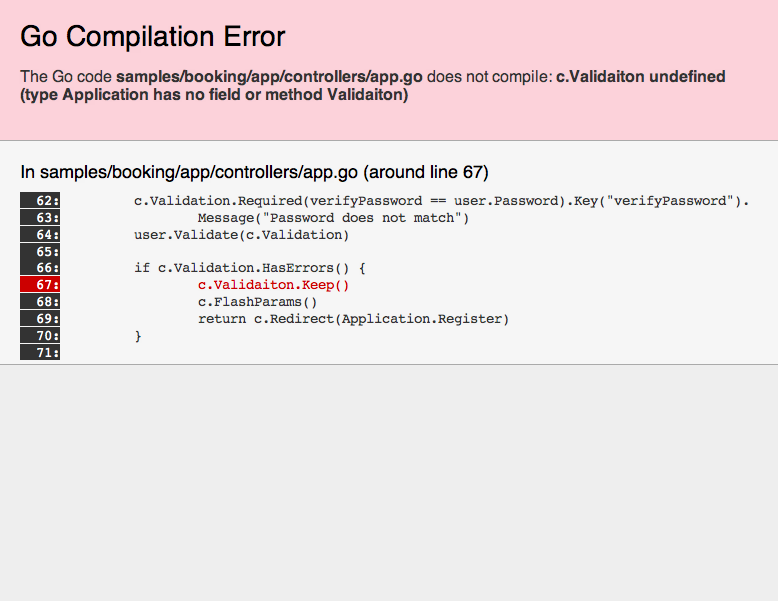 ValidationFilter,        // Restore kept validation errors and save new ones from cookie. InterceptorFilter,       // Run interceptors around the action. ActionInvoker,           // Invoke the action. Nearly all framework functionality is implemented in the filters, and the filter stack is directly exposed to the developer as part of the configuration. This makes Revel understandable and modular. There are some areas that could benefit from some TLC. Pluggable template loader -- Presently only Go templates are supported by Revel (although the developer could use their own library independently). Providing an interface that makes any template language pluggable would be ideal. 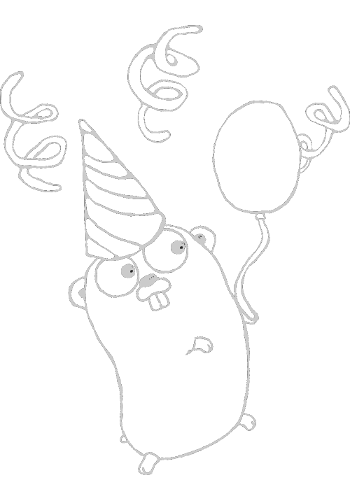 Gopher images remixed from those produced by Go team.